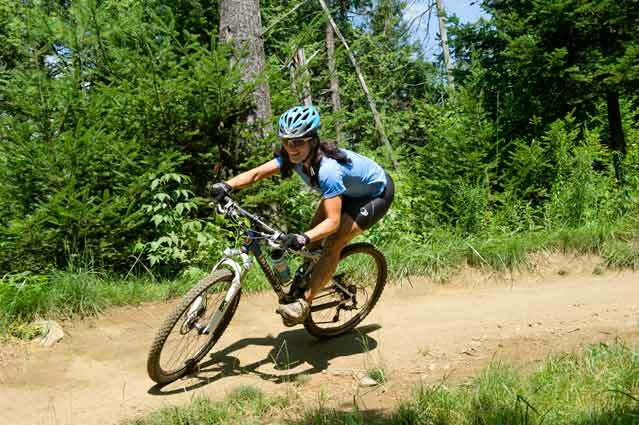 A woman smiles as she rides around a bend on a Vermont trail. The Woodstock Reservoir trails, located on Cox District Road off Route 4 in Woodstock, are not to be missed. The network consists of five major trail segments, including a recent addition called “the knob”connected by fire roads. A fire road climb up from the parking lot on Cox District road, a quick right at the reservoir and one can find the trailhead for the first loop in the far corner. The first short punchy climb is indicative of the character of these trails. There are swooping loops, tight switch backs, short up and downs, and few very sweet descents. The trails ride well both ways, can be ridden out and back, and offer a different experience each way. One thing I really appreciate about these trails is one can ride one or two segments for a short ride — perfect for a quick after-work ride with friends — or all of them, if time allows. For those less eager to explore on your own, stop by the Alpine Bike Works shop, and let’s schedule a ride. I’d love to show you around. Tony Accurso is the owner of Alpine Bike Works and Fat Bikes of Vermont located at 2406 Route 4 in Killington.